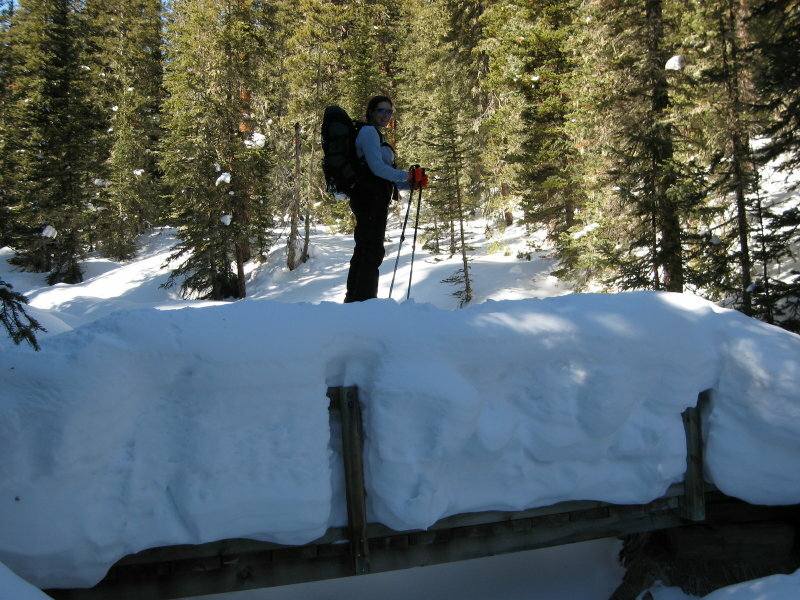 On Sunday, Dorinna and I set out to ski “The Sacred Trees”, a secret Telemark ski spot up in Cameron Pass. We had a dry week in Colorado with lots of wind, and I figured that above-treeline spots would probably be windblown, so we headed for this spot. It’s a slope that is tree-covered and sheltered. The trees are fairly widely-spaced, so the skiing in still easy. (This is often a great spot to visit when avalanche conditions are bad, although they were fine on Sunday). Below is a shot of Dorinna on the trail to our secret spot. When you notice the railings on this snow-covered bridge, you have some idea on how much snow we’ve gotten this year. Next PostNext Somebunny Loves Me!